We’re in full-swing summer here. If the heat didn’t remind me everyday, the farmer’s market sure does. Peaches, tomatoes, cucumbers..you could make a whole meal out of these alone. So that’s just what I did. I riffed off my sister’s gazpacho staple- the one she makes every summer with her unending supply of tomato and freezes for easy dinners later in the year. She literally makes gallons of it. While I love appreciating tomatoes in other ways, I did find this gazpacho was perfect for a particularly unbearably hot, humid, and languid weekend. I modified my sister’s recipe slightly, adapting it to what I bought at the market and what tasted balanced. I had purchased too many peaches I could physically eat, so I had sliced the leftovers and frozen them, planning to use them in smoothies. Then I found out they make the perfect addition to this gazpacho, adding a welcome sweetness to acidic tomatoes. Plus, they kept the mixture cooler as it whirled away in the blender. Of course, feel free to use fresh peaches. I recommend cooling the mixture in the fridge for an hour or so for the most refreshing soup. The cilantro pesto is optional, but delicious. It lends a fresh, spicy flair, but you could forgo it entirely for a sprinkling of chopped herbs or a swirl of basil pesto--whatever you have on hand! In blender of food processor, process tomatoes, peaches, cucumber, and garlic until pureed. Add bread and lime juice and blend again. Slowly stream in oil as motor is running. Add a generous pinch of salt and pepper. Taste to adjust seasoning. Drizzle with pesto, if using, or sprinkle with chopped fresh herbs. Serve immediately, or chill in refrigerator prior to serving. Serves 4 as a light meal. I have a habit of reading cookbooks while I eat- especially if I'm eating alone. I always find that I learn something new- no matter how many times I have read the book. Part of this is because I am tuning into certain ingredients depending on the seasons. I have flipped through Deb Perelman's The Smitten Kitchen Cookbook numerous times. Her recipes in the book and on her blog are always honest, and I can trust that they have been well-tested. Her little notes about why she did this and why she did that are so helpful for people like me who like mixing recipes, creating my own concoctions in the kitchen. The other day, while eating lunch, I stumbled upon her Peach and Sour Cream Pancakes recipe in her cookbook. Armed with fresh peaches from the farmers' market, I had an incredible desire to test out this magical sounding combination. Peaches and cream and peaches and yogurt have been done before, but I knew Deb was on to something with combining the rich, but lightly tangy sour cream with peaches. You could think of sour cream as behaving like buttermilk, which you often see in pancake and waffle batter, but the extra body it gives the batter a silky smoothness and pillowy texture that is unreal. Instead of making pancakes like Deb did, however, I made waffles. My waffle iron has been staring at me for a while and only getting sadder and sadder with each day of neglect. Plus, I was in the mood for a crispy outside, and little wedges I could eat as a snack. I modified ingredients to reflect my change from pancake to waffle and substituted all-purpose flour for oat flour and spelt flour, but I kept many of the basic pancake/ waffle ingredients the same. I also diced up some peaches to add to the batter so you could get a little bit of summer in every bite. Topped with a drizzle of REAL maple syrup and some sliced peaches, these made for one delicious August breakfast. In one bowl, combine the dry ingredients (flours through baking soda). In another bowl, whisk egg, sour cream, maple syrup, 2 tablespoons melted butter, and vanilla extract. Slowly add the wet ingredients into the dry and stir just until combined. Dice half of the peach and stir into the batter. Slice the remaining half in thin slices. Make sure waffle iron is well-greased and hot. I used a little butter to do this, making sure it sizzled when I rubbed it over the griddle. Add about 1/3- 1/2 cup of batter to the center of the waffle iron, add a few peach slices to the top if you wish, and carefully close. Cook for 4-5 minutes or until done. 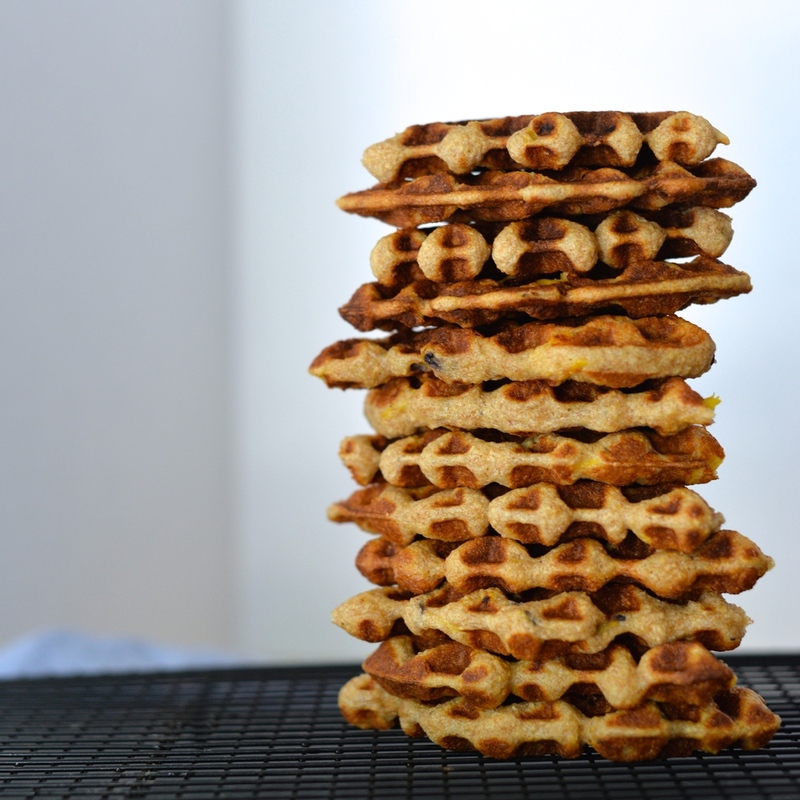 Remove waffle to cooling rack. Repeat with remaining batter, greasing waffle iron as needed. Serve waffles warm with maple syrup and fresh peach slices. Alternatively, you can cut into wedges and eat as delicious snacks. Makes about 4 whole waffles. *You can use unbleached all-purpose, whole wheat, or a mix of unbleached all-purpose and whole wheat flour instead of oat flour and spelt flour. I cannot believe I have not shared a recipe with either blackberries or peaches yet! I am also behind on the tomato, cucumber, pepper, and eggplant front too. Oh, and corn. Oh me, oh my. These are just some of my favorite things about summer, and I have been a little selfish keeping these things to myself. You see, I always get a bit torn between eating the juicy, summer fruits like these tart blackberries and sweet peaches in their uncooked virgin state and then actually cooking with them. I sometimes feel like they should be appreciated as nature intended them to be- simply washed and maybe sliced, as in the case of the peaches. But then I go and make something like this amazing sandwich, combining these fruits with an aged sharp cheddar and a tangy, salty goats' milk feta. Add a little basil for an unbelievable aroma and fresh taste, and a drizzle of honey to bring it all together. One bite, and I wonder why I have not been cooking with these little summer jewels all along. This recipe is for one, but it is really just a template and the proportions I used. Feel free to make a whole bunch of them to share with your friends and family. If you are not a vegetarian, this would be delicious with a little ham- even better if you can find some from some friendly, local farmers. But it really is quite tasty as written. 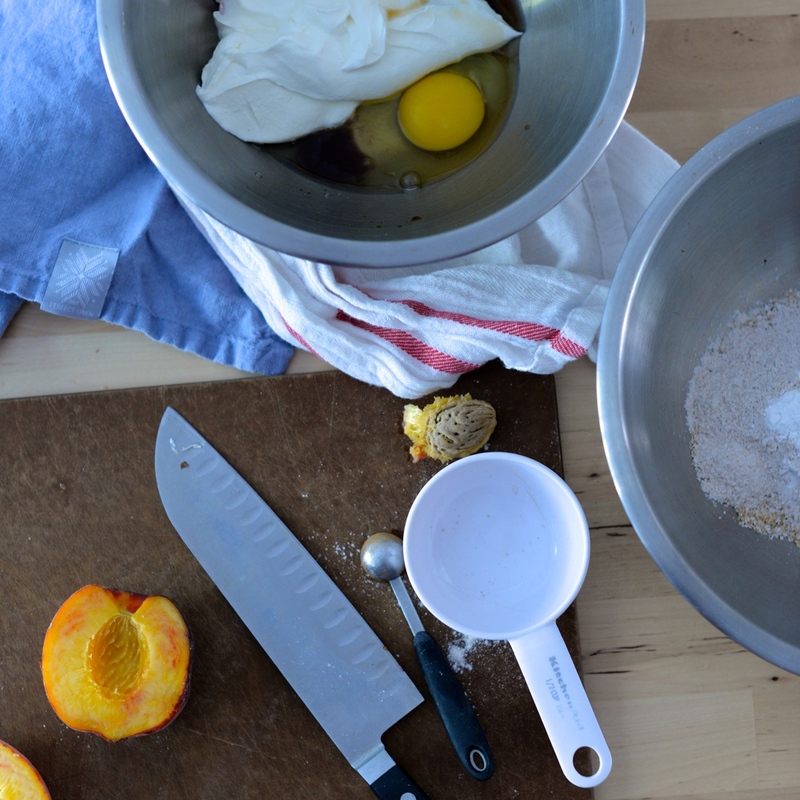 What are your favorite ways to cook with peaches and blackberries? Assemble the sandwich. Drizzle one side of both pieces of bread with olive oil. Flip one slice over so that olive oil side is down. 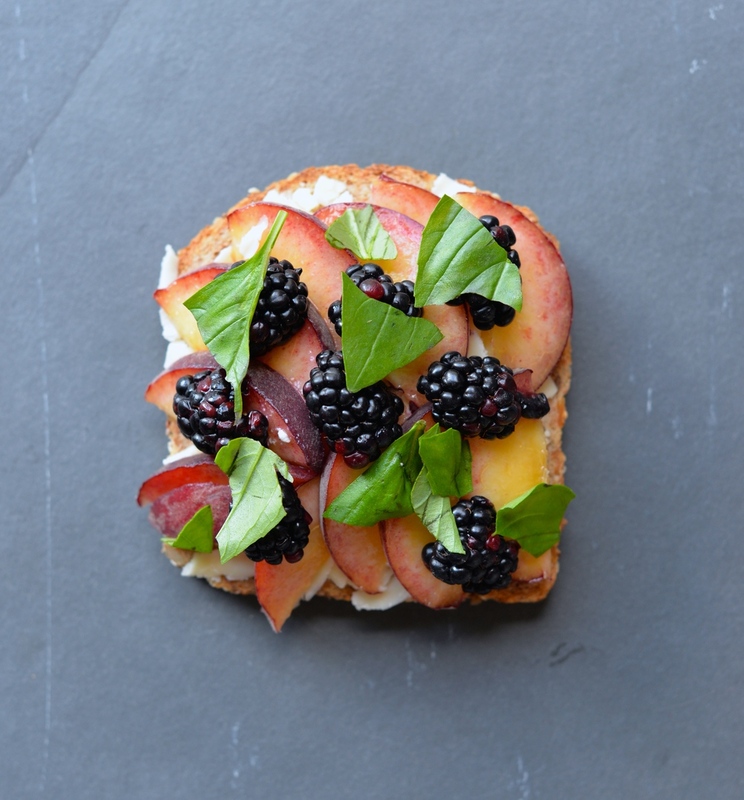 Layer on the cheddar cheese, then peaches, halved blackberries, basil, and feta. Drizzle with the honey. Place the other slice of bread, olive oil side up on top. Move the sandwich to the panini press, and carefully close the top down, being sure not to smush all of the ingredients out of the side. Grilled for 4-5 minutes or until cheddar has melted and bread is golden brown. Enjoy! Makes 1 sandwich. **If you do not have a panini press, heat a cast iron skillet over medium heat. When pan is hot and sandwich is ready, add sandwich to skillet and place a plate on top of the sandwich to weigh it down, grill for 3-4 minutes. Flip carefully, returning the plate to weigh sandwich down and cook until bread is toasted on both sides. Cook for 3-4 minutes.